Click here for our Grand Caravans! You've got a busy life. Kids, pets, bikes, work, and everything in between. It all needs to fit, and the one thing there is absolutely no room for here is compromise. That is why Bustard Chrysler for a Grand Caravan near Cambridge is the right call. When it comes to surviving and thriving here in Cambridge, you need all the durability, adaptability, and style you can get. It doesn't matter if you're taking the family to the park for a picnic or high tailing it out of town for a weekend of seclusion and rest, the Grand Caravan will get you there with cargo room to spare. The Grand Caravan is built in with family in mind, including available power doors and liftgate making getting in and out an absolute breeze. However, it was also built for the adventurer with an available engine that gets a potent 11.8L/100km in the city, perfect for hitting the road and not looking back. If either of these seem like you, or you just want a minivan capable of making your friends jealous, then come to Bustard Chrysler at 575 Davenport Road in Waterloo or give us a call at (519) 884-5888 to book a test drive! Know exactly what you're getting and what you're paying for. We offer "Getting to Know Your Car" nights. Know more about Grand Caravan with Bustard Chrysler. Every 4th oil change is free when you book the first 3 with us. Interested? Visit us near Cambridge today! 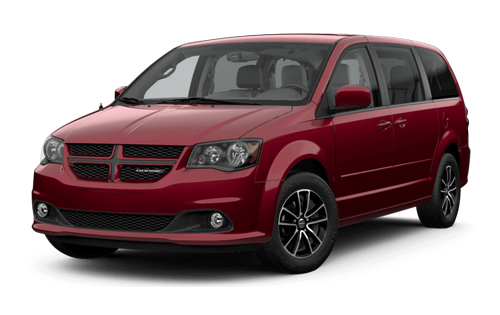 The Dodge Grand Caravan's design is often described as "ready for anything" which is apt for such an adaptive vehicle. Its distinctive aerodynamic design and available automatic and power doors make it more than up to any challenge that might come its way. If you need a little bit more flexibility, however, it also comes with an available Stow'n Place roof rack system which hides the crossbars in the side rails when they are not being used. Utility and function married together at last in he Grand Caravan. On the inside everything is highly customizable from the back seats to the cargo spaces and aisles - it can all be shifted and changed to suit whatever your needs are. All together there are 81 possible interior configurations for your back seats which include up to seven seats at the top end. In the front seat the available Super Console has expanded storage space including a drivers side storage compartment and a large storage drawer available to first and second row passengers. When it comes to safety there are few minivans in the class that the Grand Caravan helped to build. With a sturdy structure, engineered crumple zones, seven airbags and a host of other standard safety features there are very few that can match the Grand Caravan when it comes to peace of mind. Additionally, newer models have the available, and ever popular Parkview Rear Back-Up Camera and Park-Sense features which help you not only back into the space you are looking for, but will also work to detect objects in your path that may not be in immediately in view. If this still sounds like the vehicle for you, then the best place to get a Grand Caravan near Cambridge is at Bustard Chrysler. Just a short trip from where you are right now, Bustard Chrysler has the expertise, enthusiasm, and experience to get you exactly what you are looking for in a Grand Caravan. Our team believes in friendly advice, low pressure sales, and working with you to find what suits your life and budget. Come down and see us today to get started! The Bustard story began in 1947 with the purchase of a small dealership in Matheson, ON. Now, with Bustard Chrysler serving Waterloo since 1994, the Bustard brothers still maintain that the key to success is through reputation, the earning of trust, and the keeping of promises. You'll see that commitment shine through in the excellent service and quality vehicles that Bustard Chrysler has to offer. Trust Bustard Chrysler for all your automotive needs no matter how big or small. There's a reason we're the premier new and used car dealership in Waterloo! We'll get you driving away in the new or used vehicle of your dreams and can guarantee you'll be coming back to us for all your future services and purchases. Stop in a see us at 575 Davenport Road in Waterloo, ON, or call 519-884-5888 and experience the Bustard Chrysler difference. Great staff. Simon and Steve made it extremely easy with buying a new vehicle. I highly recommend Bustard and would buy from them again!